Throughout my life, I have known plenty of folks who have used roadkill for a variety of purposes. In addition to dumpster diving baked goods or produce, many of the freegan folks I knew in my twenties would eat roadkill, of course, only if fresh enough. This winter, when speaking with an elder in the urban Indigenous community where I live, he told me about the times when he and others were leaders of the Lansing Indian Center. They would get phonecalls from various people – community-members, as well as from governmental employees – when someone hit and killedwaawaashkeshiwag (deer) with their automobiles. Community-members would process the meat and then gift it to others in the community or use it in community feasts. Ethically, I love the idea of eating roadkill and honoring the spirit of those waawaashkeshiwag killed by cars. However, given that my mother has innumerable stories of death from situations potentially must less harmful, I have never eaten roadkill – in any form. Thanks mom, I guess. While I might not have eaten roadkill, I do commonly use parts from those dead animals that litter the highway and back country roads. I would say that the countless animals that line the road, wherever I travel, are the structural detritus of automobility. While we may feel bad when we accidentally kill animals with our autos, it seems that our guilt is only momentarily. Personally, I can still recall the time I ran over a rabbit as a teenager or, more recently, hit a fox when driving to my grandmother’s home on Christmas Eve. Needless to say, I cherish those times when I stop along the side of highways and county roads to honor a deceased animal and to harvest parts that I can use in my own cultural practice or – better yet – give away to others. Just this past weekend, as part of my mentoring Indigenous students at Graduate Horizons, I gifted gaawayag (porcupine quills) that I recently harvested along the road near Cadillac, Michigan to those students I was mentoring. For me, this helped establish deeper social relationships with one another and with the land. About a week ago, I was driving home from visiting family and spending time in Northern Michigan. Although driving alone, my eldest daughter, Reina, was traveling with a friend. They were about fifteen minutes ahead of me. When my daughter noticed the recently deceased body of a porcupine on the side of the road, she immediately texted me – she was the passenger – and let me know its location. When I came across the gaag (porcupine), I quickly pulled over. After offering some semaa and song, I began to remove quills from the porcupine. I filled mywiigwaas-makak (birchbark berrying basket) about one-third of the way, leaving plenty of quills for those who may have stopped by after me. As my daughters and partner know all too well, it is common for me to harvest road kill. It connects with the land and with those other being who are traveling similar pathways. A few summers ago, I picked up a bird that was infested with insects, which began to fly into the hair of everyone in the car. In retrospect, it was quote a hilarious situation, but at the time, there was little laughter. At that moment, I made a commitment to my family that I would only stop for roadkill if I am traveling alone and, more importantly, if I was driving my truck and could place the animals or parts in the bed. When my daughter texted me, I knew that even if she wasn’t stopping to harvest the quills herself, she was nonetheless attentive to the animals and to her environment. This is something we should all be doing. Where I live in East Lansing, we do not generally have porcupines. Up North, as people say around here, you’ll see lots of porcupine, both living and dead. If you know Michigan’s ecology, you realize that the northwoods start somewhere around Clare – just south of the 44th parallel. US 10 is my somewhat fictive border between Down State and Up North. This demarcation-line also helps me know when I should become more attentive to possible porcupine roadkill. While you may see porcupines (or porcupine roadkill) south of this point, I feel it is helpful to know where I should become more attentive. Wild turkeys, however, can seemingly be found everywhere. Porcupine quills are a wonderful material for artmaking. Many Indigenous nations have traditions of using quills within their art and cultural practices. While wuillwork pre-dates beadwork, it is still actively practiced throughout Turtle Island. The above image is a beautiful example of Métis quillwork in the collection of the Minnesota Historical Society. Thanks Ben Gessner for showing this important collection. Quillwork, as this artform is known, has an especially long tradition across the woodlands, plains, and subarctic. I’ve viewed wonderful archival collections of quillwork in the National Museum of the American Indian, as well as in the Minnesota Historical Society and other museums and personal collections. Quills can be used on bucksin or on birchbark and when dyed allow for beautiful and multi-colored imagery to be created. There are a variety of ways to attach the quills to the backing. Historically, quills were dyed with natural dyes, which many artist still do today. However, it is also common for quillworkers to use commercial dyes like Rit to get vibrant colors, such as quills I dyed below). I am definitely not a skilled quillworker, but the more I learn about plants and plant-knowledge, the more I can also begin to incorporate this into my everyday place in the world. Miigwetch miinwaa baamaa pii. On Saturday morning, I woke to greet the sun. Before going to bed the night before, I set the alarm on my phone, but my body arose before the phone’s harsh tones woke the entire house. I occasionally rise before dawn to learn from the plants and this was one of those days. I have become grateful for these days. As a child, I remember days like this – rising in the middle of the night to make coffee and go duck hunting with my uncle. I’m more of a harvester these days. While waking early was hard for me as a teenager, I now look forward to the days when I need to dialogue with the plants. These days have taken on a level of significance unlike any other. On this particular day, I was scheduled to meet an elder – fluent Anishinaabemowin-speaker and language teacher Howard Kimewon. I’ve known Howard for many years and he has taught Anishinaabemowin (the Ojibwe language) at, most recently, the University of Michigan and University of Massachusetts. We were meeting up in Michigan’s Upper Peninsula and I needed to call him once I reached a place called Naubinway. I like to ask Howard and the other fluent speakers the meaning of place names, but I forgot to ask him for a sound Anishinaabemowin translation of the word Naubinway. While the internet tells me it has to do with ‘looking in amazement,’ I know from past experience that common translations of local place name are often dispelled by the elders. I wonder if Naubinway is one of these words. It is the time of year when June becomes July and the birchbark is ready for harvesting. I have harvested bark with Howard for the past few summers. Although, one can harvest birchbark – or as it is called in Anishinaabemowin, wiigwaas – anytime of the year, improper harvesting can kill the wiigwaasaatig or birch tree. If the bark is removed from the living tree at this particular time of year, however, you are less likely to hurt the birch. Doing as little damage as possible, of course, is something both Howard and I care deeply about. To get to the location selected for harvesting wiigwaas, I drove 3 ½ hours north from where I was staying in Traverse City. I needed to drive across the Straights of Mackinac and west into Michigan’s Upper Peninsula. This was after a 3-hour drive ­– from East Lansing to Traverse City – the day before. As I drove, I watched the sun rise across the Traverse Bay while drinking gas station coffee in a paper cup. Other than East Lansing (Nkwejong) which is located in 1819 Treaty of Saginaw territory, the rest of this trip has been within the boundaries of the 1836 Treaty of Washington. Although I hate the fact that by driving a fossil fuel consuming vehicle I am participating in the ecological destruction of the planet, I nonetheless love good road trips and the possibilities they open up. I love the time spent alone in my truck and the thinking that happens in that space. I believe that a trip like this allows us to use the tools of the capitalist world to be reversed and used against itself. My truck, purchased used from MSU Surplus, allows me to engage in meaningful practices that might not be possible otherwise, given the way that our current existence has been structured around roads and highways – especially here in Michigan where the car is still king. While this vehicle might not destroy the system that created it, it does allow for meaningful moments of resistance and survivance. All of this passes through my head, as I drive. Once I reached Gaylord, I stopped at a big box store, grabbed another coffee and purchase some rope to tie up my bundle of wiigwaas. The stop was short, but long enough to stretch my legs. As has been done since the beginning of time, I stopped an hour later at Michilimackinac, leaving semaa before crossing the water. Unlike ancestral crossings at the Straits, I didn’t need a jiimaan, but used the bridge that was built to, among other things, accommodate deer hunters heading north. I’ve come to enjoy my migrations around the Great Lakes and be more comfortable living in a place that ­– for some time – I was waiting to leave. Although we hadn’t planned it that way, our harvesting trip was scheduled on a weekend firmly situated between Independence Day and Canada Day. As someone who identifies as an anti-colonial Wiisaakodewinini border-crosser, the timing of our gathering seems quite fitting. 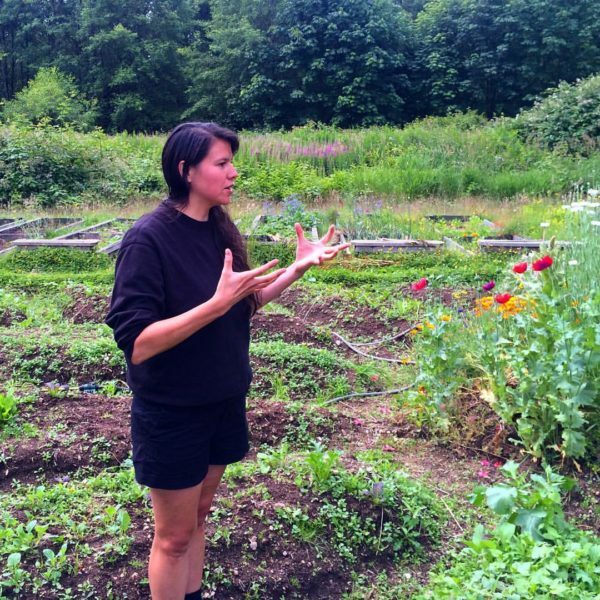 By engaging in ancestral harvesting practices and sharing knowledge on the land, we were doing our best to resist and survive in this dystopian world. Armed only with utilities knives and rope and stories, the wiigwaasaatig and Howard both shared their knowledge with me. Upon my arrival at Howard’s cabin, we visited and shared tea and told stories. I mostly listened. We joked around and caught up on each others’ lives. The power of visiting and sharing tea is commonly overlooked, but if I have learned anything at all in my four decades on earth, visiting is a fundamental human activity and one that happens less and less. I value this visiting as much as I value the plant knowledge. Howard made some wonderful ironwood tea and kindly shared some with me. This gesture centered me and I couldn’t help but recall other teas I’ve shared or have drunk and the stories they’ve shared. While drinking our tea, Howard offered stories of other teas he has made and the people he has helped with these drinks. I asked questions and sipped my aniibiishaaboo. After we both finished our aniibiishaaboo, we then climbed into Howard’s truck and headed down the dirt road in search of bark. We visited a place near last year’s harvesting location, but I doubt I could find either location on my own. Once in the woods, the mosquitos and horseflies swarmed us, but nothing a little ‘bug juice’ cannot handle. During our day, Howard shared stories; he also left me alone to dialogue with the tree. We talked and joked and engaged with the trees, both collectively and alone. The smell and feeling of harvesting bark is one that cannot properly be communicated in language. To anyone who has harvested wiigwaas, they will likely remember the sound and smell and feeling as being the most rewarding part of the experience. While I will use the bark I harvested for baskets, for bitings, for jiimaanan, and for other objects, the real importance of being in this place was learning on the land and with an elder and with the plants. Maarsii – chii miigwetch for sharing. A few years ago, I desired to learn to speak to plants and learn their language. Although I had been raised primarily in the woods in Michigan’s Thumb, I didn’t have the language to listen to the plants. I could not identify more than a few well-known varieties of trees or flowers or berries. At some point in time, the Indigenous plant-based knowledge that my grandfather’s grandmother was known to have, disappeared from my family. As an artist, I have the privilege to work in a way where my projects emerge from a desire to address certain issues or questions or – as happens most frequently – there is something I need to learn (not for myself, but rather in relationship to community). In this particular case, I wanted to learn to engage in conversation with plants. As such, I come to my practice as an artist, and especially in this project, as one of decolonial learning and sharing. Much in the same way that I began to work with bikes and youth from a collective desire to increase our shared knowledge – while sharing that with others – Michif-Michin (the people, the medicine), as I call this project, allows me the space to spend time in the woods, and on the prairies, and lakes and swamps, and anywhere else where plants grow. It is about personal and collective healing. 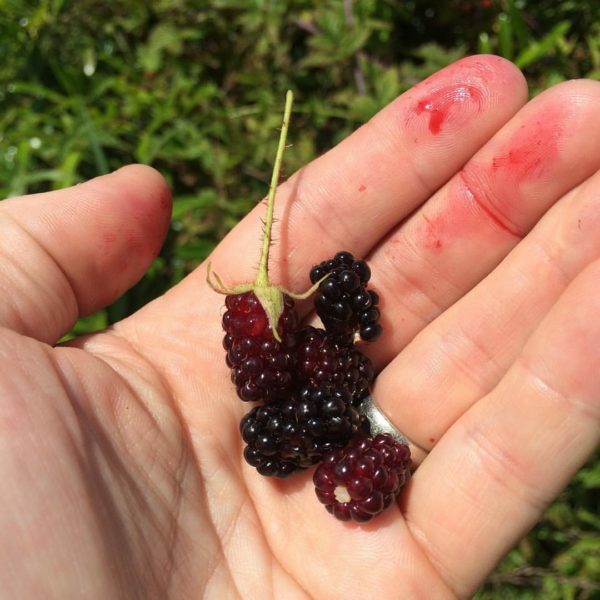 It means that I harvest berries between my activities with my daughters and escape into the woods when transferring trains in places I’d never been before. It means awakening before dawn to drive hours to meet at elder for harvesting. It means smelling like smoke and sugar during maple sugaring season. It means organizing workshops with elders who hold knowledge about manoomin (wild rice). It means traveling and visiting. It means lots of things. Michif-Michin (the people, the medicine) is about being in the world in a way that places value on relationships and not on things. But, I am a novice and I do not know much about plants. I am neither an ethnobotanist, not an expert. I am a learner at best. I am an artist and a community-member that has only recently begun to learn to listen to the plants and, at times, have conversations with them. In this process, I’ve learned how little I know and how little I can ever know. I am consistently reminded how many plants I cannot identify or understand, even those growing near my home. As I sit here writing this brief essay – having just spent time in unceded Coast Salish Territory – I cannot escape the memories of harvesting on the land: the smell and sound of harvesting birch bark in Michigan’s upper peninsula or the feeling of wet moss on my knees as I pick mossberries and Labrador tea in the far north. I recall my own shyness and awkwardness, both with plants, but also with humans. By connecting with my food and with the plants, I have become more human. I have become less awkward and more alive. Just as we must build trust with other humans – and with animal-beings – so too must we establish a rapport with the plants. While I acknowledge the important information that I have learned from other humans in the process of this project– from writings in books and on the internet; from digital conversation through email and on Facebook; through conversations over mshkiki-waaboo or while in the bush – I like to think about Michif-Michin (the people, the medicine) as a collaboration with the plants themselves. It isn’t just human knowledge, but plant-based ways of knowing. I wonder what it would mean if we started to think about the various plants as co-collaborators. What would it mean to collaborate with them? What does any of this mean? I am presently heading home from an extended visit in Vancouver, a city that sits on uncededMusqueam, Squamish, and Tsleil-Waututh lands. When I get back to Michigan, it will be time to harvest birchbark. I like the fact that much of my life is dictated my the seasons and the plants and the natural world. As I boarded the plane, I noticed a message on my cellphone from the elder with whom I harvest bark. I’m hoping he is checking in about dates to harvestwiigwaas. 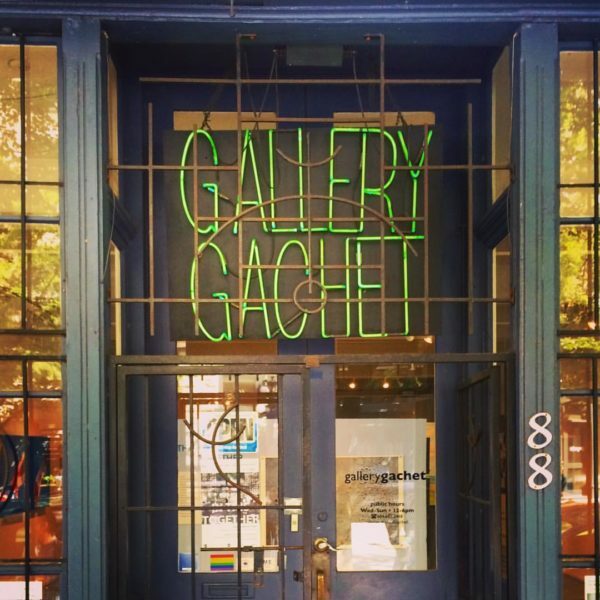 I’ve been in Vancouver working on a project for Gallery Gachet, an artist-run centre located in the Downtown Eastside. Gachet is an important space that has a commitment to the neighborhood, as well as a commitment to using the arts to address mental health. I am excited to be working in the Downtown Eastside, as well as with Gachet and the community members with whom they’ve been connecting me. I hope to write a few posts while I work on this project – a project that in many ways has simply become my life. If you follow me on Facebook or Instagram, you will see I was actively harvesting medicines while in Vancouver. While there, I spoke with cedar and yarrow and fireweed and horsetail and salmonberry and many others. When I arrived in Vancouver, I had developed a chest cold and had a throbbing headache. 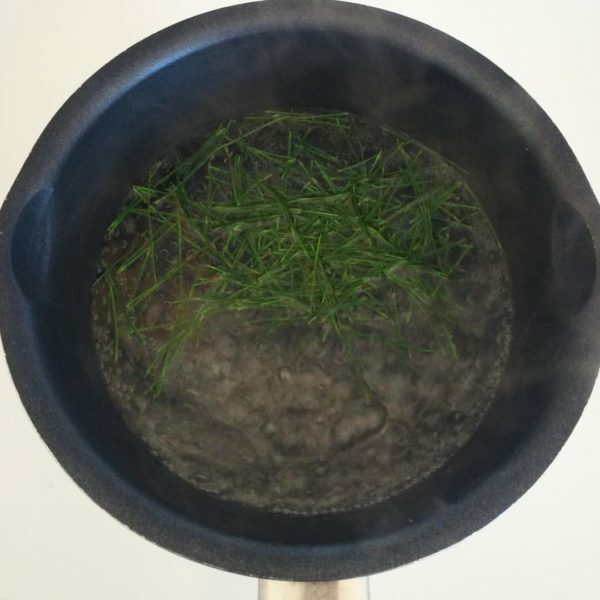 One of the first things I did was harvest horsetail, boil it and breathe in the vapors. I also made some cedar tea and engaged in ceremony. Moreover, I spent time meeting with elders and community members, sharing food and stories and time. Last week, T’uy’tanat (Cease Wyss) conducted a beautiful plant walk in Stanley Park, which was organized by Gallery Gachet as part of my project here. Nearly fifty people attended. 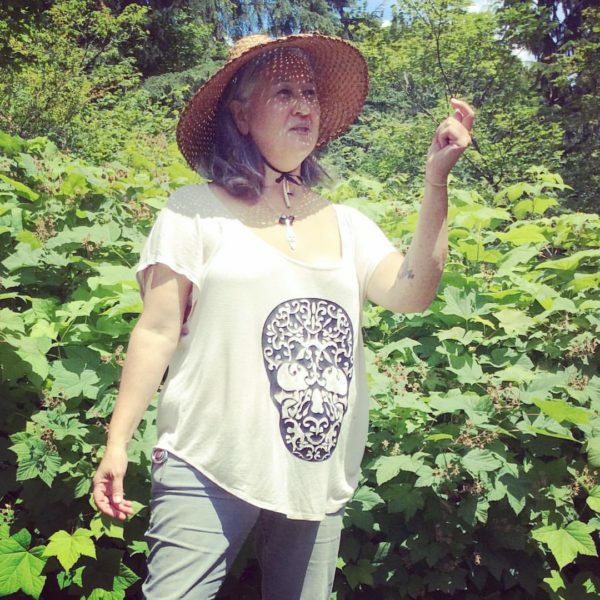 The large number of people attending is indicative of the need for many of us – Indigenous, settler, and arrivant alike – to learn to speak with the plants. Cease is doing important decolonial work. 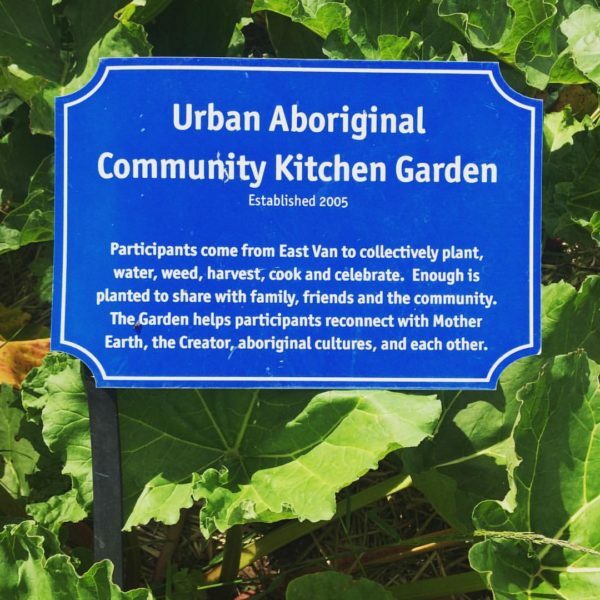 I also traveled with Anne Riley and Cecily Nicholson to the University of British Columbia, where Anne shared stories and knowledge about Indigenous community gardens. Cree elder Robert Bonner organized ceremonial activities and gifted me some sage. I shared a meal with Rodrigo Hernández and members of his collective, discussing Indigenous medicines and anticolonial struggles in México. 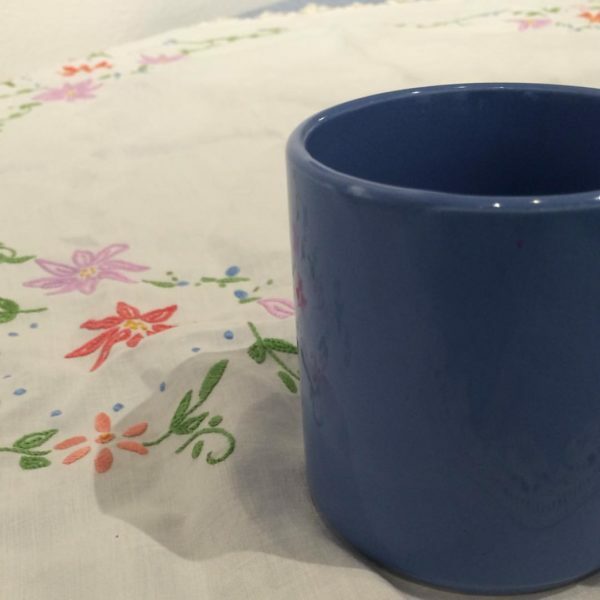 I ate dosas with artists Carmen Papalia and curator Kristin Lantz. Community members from the Downtown Eastside shared songs and bannock and tea. We shared stories in the gallery and made new relationships. I shared dinners and walks and spoke with the plants. I believe that art has the possibility to be many things and that many things can use the language and infrastructure of art. I imagine a world where art is the way in which we build non-colonial and non-capitalist modes of being in the world. This is but one attempt. Activist art has the ability to resist and challenge repressive and colonial and capitalist institutions and structures. I think this kind of work is needed. However, I also believe that we need to remember that other ways of being in the world are still possible. Many people are still living them and that since time-immemorial, many communities have been practicing ways of being that are beautiful and fulfilling and non-colonial. I hope that, if nothing else, I can use my privilege as an artist to practice some of these ways, while imagining new ones. I think the plants can help us in this regard.